At any rate, I also wanted to mention how thrilled I am that I now have 18 followers!! I love you, my followers! I really, really have grown to treasure this blog. I always enjoyed writing, but never fully found the right outlet for it. I never could keep up a traditional journal, and although I loved creative writing as a young adult, I never pursued that more formally as an adult. This blog is truly ideal for me. I allows me to write and be creative without taking up a lot of time, and I have the opportunity to explore topics that are meaningful to me. It's like my own personal little space in the world :) I'm a happy girl. Just please - never remove yourself as a follower even if you decide never to read my blog ever again - this would devastate me :) Once a follower, a follower FOR LIFE. One last housekeeping item, and then I'll move on to the topic of the day. My new rosary from Cam at A Woman's Place... is in the mail, so I refrained from entering this week's giveaway lest I become too greedy :) But Cam has a beautiful rosary bracelet with St. Gerard medal up for giveaway this week! Head on over to enter for a chance to win it. St. Gerard is the patron of expectant mothers, so this would be a great gift for yourself or a loved one who is expecting a baby. There are more for purchase at Cam's etsy store, Full of Grace Creations. Lately, Mike and I have been watching Season 3 of Mad Men on DVD. What on earth does this have to do with childbirth, Tiffany? Stay with me. Anybody else watch Mad Men? Great show on AMC. It's set around a New York ad agency in the early 1960's. It's a fascinating, nostalgic look back into the culture of that time period. The ad men knock back whiskey during business meetings and pat the secretaries asses at will. And everybody smokes. And drinks. Even the pregnant women. I didn't say it was good nostalgia. It's just a very evocative period piece. At the end of Season 2, we find out that Don, the main character, and his wife, Betty, are expecting their third baby. At the beginning of Season 3, we see Betty at the end of her pregnancy. The episode that so captured my attention is appropriately entitled "The Fog." The episode opens, and we find that Betty has gone into labor. She and Don hurry to the hospital. The setting is Summer of 1963. And this is how Betty's labor experience went. Don pushes her in a wheelchair to the main reception desk at the hospital. A nurse greets them. "Ok, Mr. Draper. Your part here is done. You go to the waiting room and we'll take it from here." "Ok, Mrs. Draper, we're going to prepare you for delivery now. You will be shaved and given an enema." This is where those "not so polite" words come into play. The degrading nature of both of these totally unnecessary procedures got my eyes narrowed right away. But the worst was yet to come. Pretty soon Betty is understandably writhing in terrific pain, and the nurse keeps poking her arms to give her unspecified pain medications despite her protests. She's told that the medication will put her into a "twilight sleep." Soon thereafter, Betty begins to hallucinate. She wanders in and out of consciousness. When conscious, she's still in so much pain that she thrashes and calls out for her husband. The nurses restrain her, tying her limbs to the bed, and telling her that her husband is not permitted to come back. "Betts...the baby is a boy." "Oh. A boy. Yes, a boy." That's right, her husband, who was in *another wing of the hospital at the time* knew the gender of their baby before she did. In the case of an emergency cesarean section, I could understand this, but not when an uncomplicated vaginal delivery is involved. This brought back a memory of my own mom telling me about the birth of my older sister, Rhonda, who was born in 1970 and the only one of us for which she had a vaginal delivery. "oh yes, I remember pushing for a little bit, and then the doctor told me that they'd take it from there, and they put a mask over my face to put me out." *Catholic Librarian's eyebrows raise to ceiling* "But, but...why would they do that? How could you deliver the baby if you were unconscious?" "I don't know, I was just grateful." I was always so shocked by that story I never really knew what to think. Now, after some Googling yesterday, I know that this "twilight sleep" thing was very prevalent into the early 1970's. And, there was a whole lot of buzz about it in the context of this particular episode of Mad Men. Apparently, the way I felt after watching the episode was the exact reaction the writers were angling to portray. Betty's frantic, pain-filled emotions, the helplessness of her situation, the utter lack of choices or control she had over her birth experience, her isolation from her husband, were so palpable that I'm still thinking about them 2 days later. Granted, there are certain things that can occur during labor that can impact our birth experiences in a way that we did not plan for. This happens all the time. Most women do not plan to have a c-section. But they happen, and you do what is recommended by your doctor for your own health and the safety of your baby. This was something else entirely. There was a "this is just the way things are done" aura going on, and women did not feel free to question it back then. Having a vaginal delivery, but yet being denied the opportunity to even witness your baby's birth and experience it with your partner just blows my mind. I was speechless after the episode ended, it was just so horrible. Oh, and this is how it ended. Poor Betty, marooned in the hospital for weeks afterward, is in front of her hospital room window holding the baby, waving to her other 2 children down on the sidewalk below. Because, of course, they were not allowed into the hospital to see their mother or their new brother. Even now, 2 days later, the whole thing still makes me angry. It was an excellent, excellent episode, and it really made me think hard. We women are called to sacrifice of ourselves in many ways. For some women, one of these ways is through childbirth. And I'm glad that nowadays we have some say in how we experience and offer up that suffering, if that makes any sense. I agree. Things are so much better now. Because I was so big, the doctor told my mother that she needed a C-section (I think that they would have told her to try and have me first or induced now-a-days). And then when my much smaller brother came along, he was a c-section because they didn't allow VBACs. And to top it all off, he was born a week early because the dr was going on vacation. Geez. Things are so much better now. Women get the choices; not the doctors. I couldn't imagine being in a twilight state to give birth to my son. The experience was a total adrenaline rush, and I loved it in a crazy twisted sort of way. I guess that why some people get weird piercings and tattoos. Out of pain comes beauty. 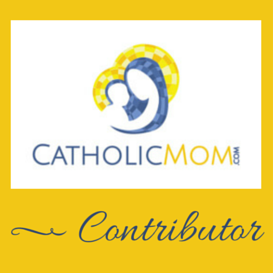 Oh, I stumbled upon your blog after you won the rosary. Congrats! And I totally love your blog. It's awesome; you write really well. I wish that I wrote a lot better. I used to, but I've used up my last brain cells giving birth. That and the lack of sleep thing. Having a two month old will drive you a little coo coo sometimes. Hi there! So happy to see you on my blog :) And I'm so glad that you are enjoying it!